I am sharing a swap card with you. I had the opportunity to do a Swap with fellow Demonstrators and I fell in love with this one. I have all the details how to make this. It’s pretty easy. Cut Balmy Blue cardstock 4-1/4″ X 11″ and score at 5-1/2″. Stamp Paw prints with Balmy Blue ink. Cut White 3-10/16″ X 4-14/16″. Punch all four corners with the trio punch. Adhere to card base with Snail. Cut a Balmy Blue Gingham piece 3 X 4-1/4″ and adhere to the card with Snail adhesive. 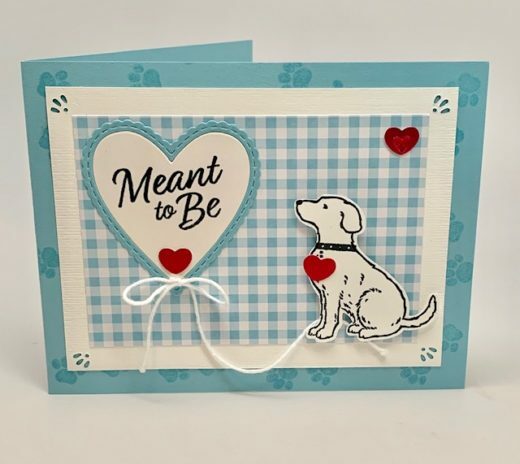 Stamp saying and dog using Memento ink on Whisper White cardstock. Punch dog out with coordinating dog punch. Attach with a dimensional. Run the Meant to Be framelits for hearts on the lipstick foil sheet and the heart with the Meant To Be framelit. Cut the Meant to Be piece with the heart framelit and run them through the Big Shot at one time. Attach to the card with Snail. Tie a bow with the Bakers Twine and have a long loop to the dog. Attach with glue dots. Attach the hearts to the card with a glue dot. Attach an epoxy heart to center of the top right heart. Cut a piece of Whisper White 3-10/16″ X 4-14/16″. Use embossing buddy across the white piece. Stamp saying with Versamark and sprinkle Lovely Lipstick on the saying. Use heat tool to set. Stamp two pay prints in Black Memento ink.